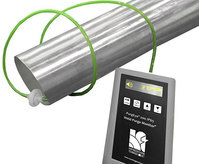 To remain at the forefront of weld purging technology, weld purging experts and inventors of the Weld Purge Monitor®, Huntingdon Fusion Techniques HFT® have launched the updated hand-held PurgEye® 200 Weld Purge Monitor®, now with PurgeNet™. The PurgEye® 200 Weld Purge Monitor® reads down to 1 ppm (very accurate to 10 ppm) for the accuracy that other oxygen measuring instruments don’t give. The Monitor is IP65 rated, which means it can be used in very demanding areas where instruments are used on site, such as in desert or tropical conditions. PurgeLog™ software also gives Weld Purging results to give quality control documents for each weld. The monitor also has the capability to switch between percentage oxygen and parts per million shown on the display.